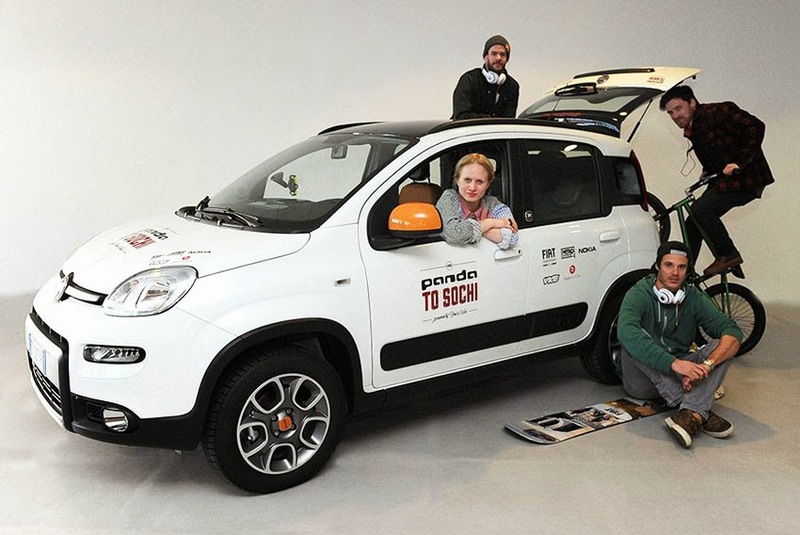 'Panda to Sochi' officially set off from Mirafiori Motor Village in Turin. Taking centre stage in this project is the Panda 4x4 Antartica, the Limited Edition model that celebrates the 30th anniversary of this top-selling 4x4 model, with more than 500,000 cars sold. Sochi' project stems from collaboration between the Fiat brand and the multimedia publisher Vice Media, which addresses young metropolitan people who not only love new fashion, sports and music trends, but are also interested in the world of art and culture. The other prestigious brands involved in the project - Nokia, Nitro Snowboards and Beats by Dr. Dre - also unfailingly meet the requirements of this specific target. Also on hand at the 'Panda to Sochi' starting ceremony were Fiat Freestyle Team riders Stefano Munari - star of Italian snowboarding - and Stefan Lantschner, a BMX talent from the Alto Adige area, together with Markus Keller, the famous Nitro team rider who will take turns with Dmitri Sartor during the trip. They were joined by Gersin Livia Paya, the Editor of Vice, who completes the team that will travel to the site of Casa Italia in Sochi (Russia). Using the Nokia 1520 with 6-inch super-sensitive full-HD display, Gersin will tell the story of the journey in real time, with images and videos taken using the 20 mp pureview camera and shared through social media, while the HERE maps will guide the team to their destination. The team will stop off at 16 different European locations – some of which the general public is unfamiliar with – during its trip to Sochi with the aim of capturing the most peculiar aspects of the local cultures. A team of outstanding photographers and videomakers will also immortalise the crew's tricks and manoeuvres in a few characteristic locations like Dracula's castle in Transylvania and the Potemkin Stairs in the Ukraine, or at other spectacular geographical sites like Mont Blanc and Lake Geneva. The young people will have the chance to meet and interview athletes and trendsetters of the towns they go through.